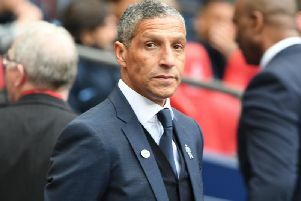 Chairman Tony Bloom called Brighton & Hove Albion's late comeback at Millwall a 'miracle' as the Seagulls reached their first FA Cup semi-final for 36 years yesterday. Albion appeared to be heading out at the quarter-final stage for the second successive season when Aiden O'Brien tapped home Millwall's second on 79 minutes. However Jurgen Locadia pulled a goal back two minutes from time, before Solly March's free kick deep in injury-time squirmed through Lions keeper David Martin's hands to make it 2-2. After neither side could find a winner in extra-time, Albion held their nerve to progress to the last four 5-4 on penalties and they will now face Manchester City at Wembley. Talking to BBC Sussex, Bloom said: "It's fantastic. On 88 minutes we never thought we were going anywhere and then miracles do happen. Man City, here we come." Lifelong Albion fan Bloom also recalled Albion's run to the final in 1983 and said: "I love the FA Cup and I remember like it was not so long ago that we played Sheffield Wednesday and Manchester United in 1983. They're memories and it's been a long time and we cannot wait." Bloom hopes Albion can go into the Manchester City semi-final on the back of a third successive Premier League win to ease any relegation fears. The Seagulls host Southampton on March 30 and asked about securing Premier League survival again, Bloom said: "That's a necessity for us. "We've got a big game coming up against Southampton and it would be great to win that as it would probably put the Premier League to bed. It would be nice to win that before the Man City game." Bloom added the Brighton fans deserve the trip to Wembley and praised their support at The Den. He said: "They were unbelievable throughout. We heard them throughout the whole game, even when Millwall's crowd were very vociferous in the second half. "They were brilliant and they deserve everything they get."